USMLE and Residency Tips: Does the timing of the interview affect the ranking of applicants for NRMP match? Does the timing of the interview affect the ranking of applicants for NRMP match? Today I am going to write on an interesting article that came across my attention. This article is important because it deals with a perennial question - Does the timing of the interview affect the ranking of applicants for NRMP match? The authors studied this question by involving ACGME accredited EM residency programs in a multi center study. 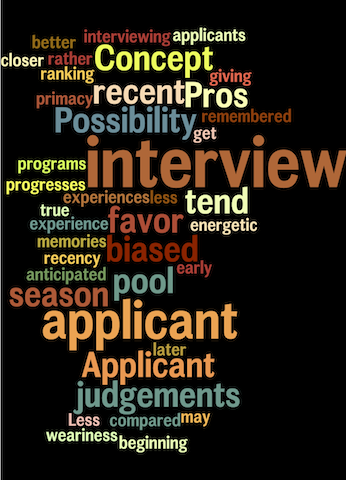 Programs were asked about factors that might potentially bias interview date assignment. 3800 applicant interviews were analyzed. From the result section from Martin-Lee et al. "Twenty three programs, representing 1,997 interviews, reported potential bias in their interview date assignment. results revealed no linear correlation. All programs, and programs with and without reported bias showed no significant difference in average interview date for ranked and unranked interviewees (both with p > 0.2). In Conclusion, in this study, interview date for EM residency positions in the 1997–98 season did not affect match list position among ranked applicants. Moreover, interview date had no effect on the decision to leave candidates unranked. 1. Concept of primacy - judgements tend to be biased in favor of less recent memories. 3. Less interview weariness for both programs and the applicants. In spite of these differing views, the authors did not find evidence of either primacy or recency among the selection practices of the vast majority of EM residencies participating in the NRMP match. On a personal note, some of my best interview were later in the season and I matched to a program where I interviewed last. Thus it may vary on individual basis. Acad Emerg Med. 2000 Sep;7(9):1022-6.